We want to help you celebrate the great moments in life! We’ve been very busy putting together special gift ideas that complement our best selling coffeecakes—and we think our new cake stands are just the thing. 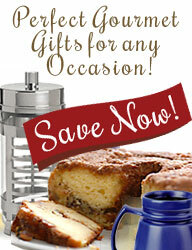 Check out our cake accessories that’ll make any occasion festive and fun! Wow your friends and family with our colorful and delightfully decorated plates and dishware. Our selections will add flair to any celebration! If you’re throwing a party, celebrating an anniversary, birthday, or are just looking to give any special someone a heartfelt reminder of your affection, these cake accessories are the perfect way to brighten anyone’s day. And don’t worry—all of our new additions are dishwasher and microwave safe for your convenience. An elegant way to present a breakfast, buffet, brunch or dessert. This Victorian style porcelain cake stand is 10” in diameter, 6.25” high, has a 9”x9” serving surface. Hand washing recommended. A modern interpretations of the iconic cut glass cake plates of 1920's America. This apron pedestal in a gift box is 5.5” high and 13.25” in diameter with a 11.5” serving surface. Make a striking statement when laden with cakes or hors d'oeuvres. NEW - Eat dessert first! Celebrate dessert with this colorful set of 4 (8”) assorted scalloped dessert plates decorated with sweet designs of yummy dessert cakes and colorful polka dot designs. Whether celebrating a birthday, anniversary, or any meal these will add a flare to any celebration. Made of refined porcelain, in a festive round cakelike gift box. Microwave safe and dishwasher safe. See matching festive “Eat dessert first!” 16” serving platter. These CELEBRATE dessert plates are designed by Rae Dunn and handmade by artisans. These are 6" party stamped dessert plates with a balloon, a gift package, a piece of cake, a flute of champagne, a party hat and a party favor stamped on them which makes them unique and fun. These handmade plates are dishwasher safe and microwave safe as well. These CELEBRATE plates will make any celebration festive and fun! Comes in a gift box!